Style L Prewound Plastic-Sided Bobbin. Continuous polyester parallel wound for smoother winding. No fuzz, lint, or wax buildup like paper bobbins. No distorted flanges from humidity or oil. The clear plastic bobbin works on machines with bobbin sensors. 135 yards/bobbin, 144 bobbins per box. 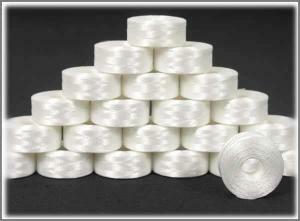 60 wt./2-ply polyester, White color. Not for Class 15 Bernina, Singer & Janome ;or special Viking or Pfaff bobbin replacement. Primarily for Brother made drop-in-bobbin machines such as Simplicity, Bernina-Deco, Babylock, White and Brother/Disney embroidery machines. Babylock older model Ellageo, Ellure, Esante, Espire & Intrigue, not the newer model Elegante, Ellure, Esante, Emore machines which take Brother SA156 Class 15. I was recommended this product from the store I purchased my embroidery machine Stitchin Post in Little Rock. 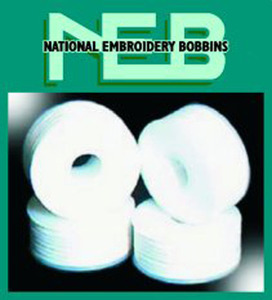 Karen, the person who has helped me with my software understands my desire for pre-wound bobbins. I have been extremely pleased with the product and when I have time, hope to visit your website for other items. Thank you for caring about my thoughts. I was completely satisfied with your service and product. My husband thinks that your company has dealt with this customer service in a very fast way. Not every company deals with customer service the way you have. For that we both thank you. Everything came really fast. I was very impressed at being able to get the brands I wanted at great prices with very fast shipping - even over the holidays! Fairly easy shopping, considering I had an uncommon item. Fast shipping!